Walk to hatch eggs and get better Pokémon in Pokémon GO. This guide offers everything players need to know about hatching eggs in Pokémon Go. Pokémon Eggs are not only great way to obtain new or rare Pokémon species, but they are a descent source of additional XP, Candy, and Stardust as well. Pokémon Eggs are some of the most useful items in terms of leveling up fast and obtaining rare characters in Pokémon Go. Players must walk with their eggs in incubators in order for them to hatch. There are currently three types of Pokémon Eggs available, each with a designated distance the player must travel to hatch the egg. Pokémon Eggs, not to be confused with Lucky Eggs, are interactive items that can be hatched to obtain new Pokémon. Pokémon Eggs are collected from checking in at PokéStops. You can have up to nine Pokémon Eggs in your inventory, and each must be placed into a separate incubator in order to hatch. Every player starts out with one egg incubator that has an infinite amount of uses. More incubators can be purchased from the Shop menu for 150 PokéCoins each, but these incubators are consumable items that break after three uses. Egg incubators are also rewarded upon reaching certain trainer levels as well. To begin the egg hatching process, open the Pokémon menu and select the Eggs tab. Tap on an egg that you wish to incubate, then press the Start Incubation button to place the egg into an empty incubator. Each incubator can only fit one egg at a time, so you will need to have several incubators if you want to hatch multiple eggs at once. After you’ve got some eggs in incubators, walk around with the app open to begin the incubation process. Pokémon Eggs will incubate in the background as you play Pokémon Go, but only when moving. Each egg requires the player to travel a certain distance to hatch the egg. Pokémon Eggs come in three distance types, indicated in kilometers: 2km, 5km, and 10km. The further the distance required to hatch the egg, the rarer the Pokémon species will be inside. Keep in mind that Pokémon Eggs will not incubate if you are traveling over certain speeds, so don’t expect to hasten the incubation process by driving on the freeway or riding a train. However, different forms of transportation will work as long as you travel slower than about 12 Mph. When a Pokémon Egg finishes incubation, an egg image will pop up on the screen. Tap the screen to reveal your newly hatched Pokémon. Hatching Pokémon Eggs grants an additional 200, 500, or 1000 XP per egg based on travel distance, making this one of the best sources of significant XP beyond capturing and evolving. Bonus XP is also rewarded if the Pokémon species is new to your PokéDex. Incubate several Pokémon Eggs of equal travel distance all at once, so that they will all hatch together at nearly the same time. Keep an eye on the progress meters for your eggs. When they are about to hatch, consume a Lucky Egg to double your XP gain for 30 minutes. This will grant you between 400 to 2000 XP per egg hatched if you can get them to hatch all at once within the Lucky Egg time period. For more details on leveling up, head over to our guide on How to Earn XP and Level Up Quick in Pokémon Go. The 10km Pokémon Eggs will hatch a rarer species, such as Snorlax, Lapras, Dratini, or another rare Pokémon. 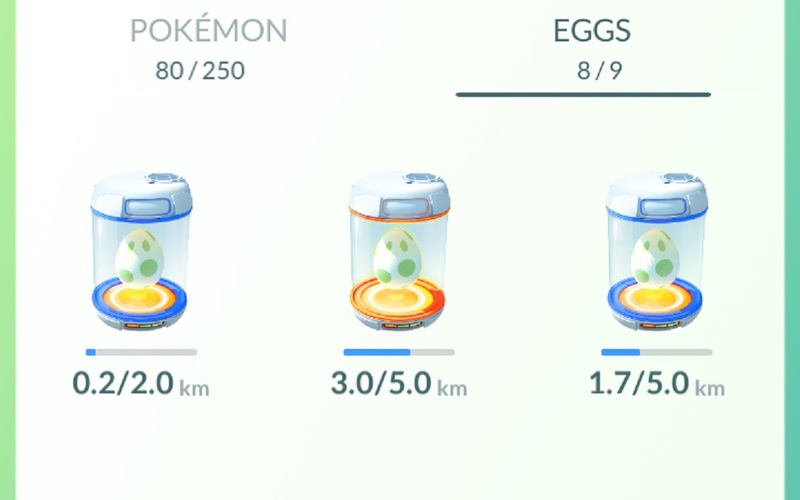 If you are tired of repeatedly finding the same wild Pokémon in your area, be sure to incubate your 10km Pokémon Eggs to obtain rarer Pokémon species. 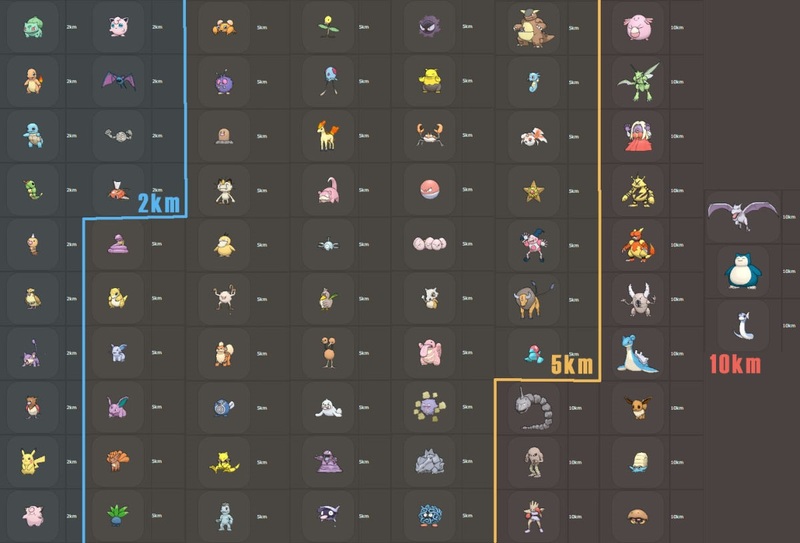 We have included a chart from Serebii.net that illustrates the kinds of Pokémon you can expect to find in each Pokémon Egg based on its travel distance. Hatched Pokémon Eggs also tend to grant higher quantities of Candy and Stardust, which are required for power ups and evolutions. As long as you continue to keep at least some eggs incubating at all times, you may be able to collect enough Candy to evolve a certain species from hatched eggs alone. Hatch enough eggs in Pokémon Go, and you’ll be dubbed the Mother (or Father) of Pokémon in no time.